Ruby-red cranberries often appear on holiday tables, but they are a healthy and flavorful fruit for any time of year. Cranberries supply a good source of vitamin C and the fruits contain antioxidants that help prevent heart diseases, according to the University of Georgia. Unlike other berries, the tart cranberry isn't served fresh or raw. Instead, it's cooked first to help temper its tartness. Once cooked, puree the berries into sauce or jelly, or serve them whole in their own juices. Wash the berries in cold water. Discard any that are overly soft, wrinkled or damaged in any way. Mix 1 cup water with ½ cup orange juice in a saucepan. Bring the mixture to a boil. Dissolve the sugar in the boiling water. Add the cranberries to the sugar water. Boil the cranberries for approximately 10 minutes, stirring occasionally so they don't burn to the bottom of the pan. The cranberries are done when their skins begin to crack and the sugar water begins to thicken. Pour the cranberries into a serving or food storage bowl. Allow them to cool to room temperature before serving or storing. The sauce gels around the berries as it cools. If you prefer cranberry jelly without the hole berries, mash the berries after cooking while they are still hot. 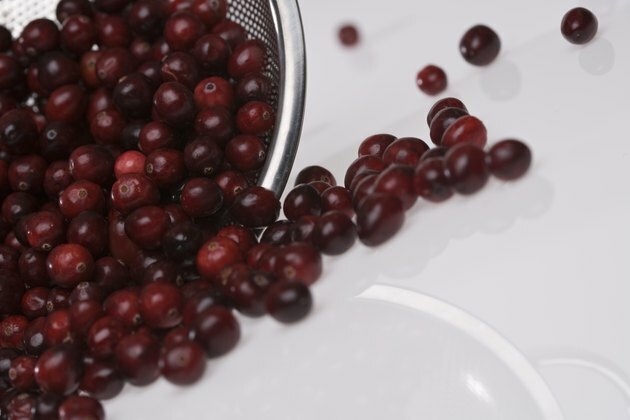 Strain the jelly in a sieve or jelly bag to remove the cranberry pulp. Use either fresh or frozen cranberries in your cooking.